Positive Care has been entrusted to care for over 400 young people who are looked after by the State. We work in partnership with TUSLA to ensure all young people receive quality services. These include therapeutic residential care, access to education, access to psychological services, integration into local communities and preparation for aftercare. We employ and invest in over 250 people; more than 80% of our management team have grown and developed from within the company. All of our teams understand and contribute to our vision for all Young People in Positive Care. Our mission is to provide responsive, creative and flexible residential care services which are safe, caring, warm and fun for young people in our care. We will do everything possible to promote the education, social and psychological development and wellbeing of each young person in our care. 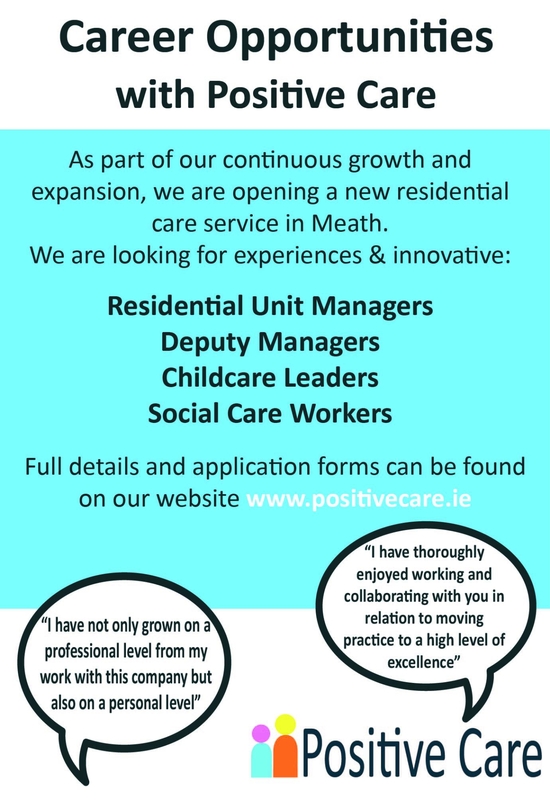 Positive Care have openings for Residential Unit Managers, Deputy Managers, Childcare Leaders and Social Care Workers. For more information on the positions, please see below. To apply, visit www.positivecare.ie.